Price: $384.00 (regularly $519.00) 24% Off! Sit back and enjoy the unparalleled bird’s eye view of Lake Mead, the Hoover Dam, several extinct volcanoes, the Colorado River and the beauty of the Mojave Desert. 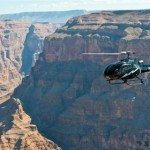 After you pass the West Rim of the Hualapai Reservation, you’ll begin a breathtaking 4,000 foot descent to the floor of the Grand Canyon. You’ll experience up-close views of ancient rock formations, the Canyon walls and the softly flowing Colorado River, which has been carving the Grand Canyon for billions of years. Your singular experience continues as you explore the Canyon floor, sit down for a delicious champagne picnic meal and relax under a “ramada,” which is a traditional Hualapai shelter. The gorgeous views don’t end at the canyon. As your helicopter takes you back to where the journey began, you’ll fly over the glamorous Las Vegas Strip.